Summer in Japan means hot, sweaty, sticky hell! Time to bust out the most summery of garments, the yukata. It’s rainy season here in Japan, but before long the Hanabi Matsuri (花火, fireworks festivals) will be making their fiery rounds across the country, taking their unofficial exit with Obon (お盆) in August. 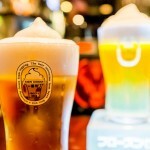 If you’re new to Japan, here’s a newsflash: summer in Japan is hot. It’s sticky. Most foreigners melt into the sidewalks, only to be reanimated by the arctic blasts of the train AC. 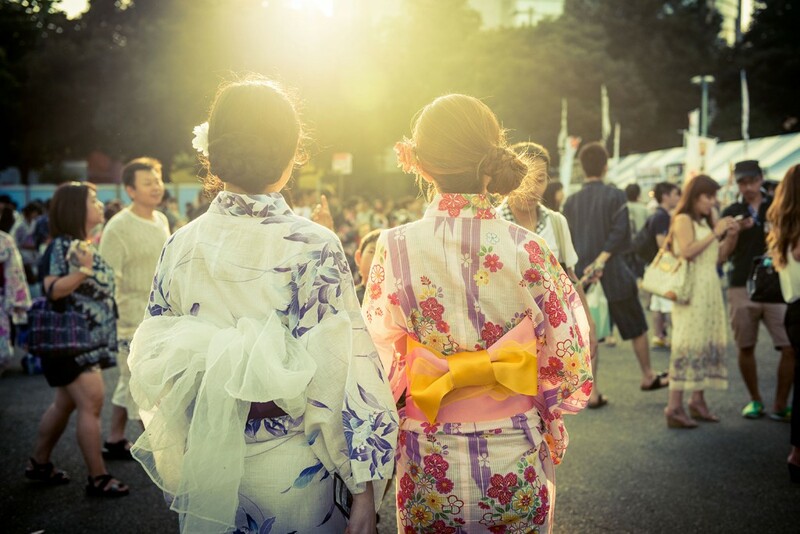 But fear not, sweaty newbie, for the traditional summer fashions of Japan are pretty much spot on, featuring the most summery of garments: the yukata. A yukata (浴衣) is a type of summer kimono, made of unlined cotton, and worn by both men and women. Some people prefer to wear jinbei (甚平, a short kimono and shorts set) for festivals, but the Japanese folks I’ve spoke to told me that jinbei is really to wear around the house. (Is this a debatable fashion issue? Discuss amongst yourselves). Yukata are constructed of straight seams and have no curves or particular fit to them, save for the wide sleeves and robe length. The traditional fit is to have the bottom hem hit at the ankle. The sleeve extension varies- sleeves on lady-yukata are generally much wider than the man-version. Patterns for young women are usually bright and floral, for older women and men they tend to come in more muted tones and patterns, indigo being the most traditional color. The left side of the robe is wrapped over the right and tied with a koshi-himo (腰紐, a simple, thin sash) for men, or an additional obi (帯, wide sash) for women, which is tied in the back. Traditionally yukata are worn with geta (下駄, traditional Japanese wooden sandals) and bare feet. I’ve asked a few local women about the shoe situation, and the consensus is that, nowadays, you can wear just about any cute sandal with a yukata– not wearing geta isn’t going to get you flagged by the Japanese Fashion Police. For girls who like to be fancy, you can wear a kanzashi (簪) a hair ornament (kind of like an ice pick) or comb worn with kimono or yukata. They range in style from super flowery and ornate to sleek, colorful designs in resin or metal. Underneath the yukata tradition says you should wear hada-juban (肌襦袢), a thin washable layer that is a cross between an undershirt and a slip. The ladies I spoke to said just wearing a tank top and shorts, or a slip is enough; just make sure whatever you wear is thin, form-fitting, and breathable for comfort. There are loads of specialty kimono and yukata shops, and the prices vary dramatically, from 2000 JPY to insanely expensive. Most department stores, like Marui, also sell yukata, but again, the prices tend to be higher. In Tokyo, Nippori’s Fabric Town District offers a wide range of both new and vintage kimono and yukata at very affordable prices. If you want to buy a new yukata just for a summer party or Hanabi, check out Ito Yokado or Uniqlo for cute, inexpensive styles. Rakuten also sells inexpensive yukata, and even rents out full sets (including yukata, koshi-himo, obi, and geta) for single event wear. I heard they usually sell them. Another inexpensive place that I heard about is Shimamura (http://www.shimamura.gr.jp/). 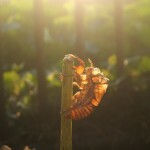 One of the most recognizable sounds of summer in Japan is the screeching of the cicada. Where do these critters comes from and what are screeching about? 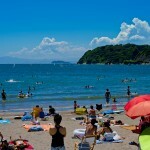 Here are 4 fantastic bargain beach trips from Tokyo that you can visit without breaking the bank.